Catherine was born in Scotland in 1958. Catherine Forshall grew up on the West Coast of Scotland where childhood fishing trips for Mackerel with her father have influenced her life long love of the sea. She has spent some years living in the Mediterranean and is a keen champion of marine conservation. Unusually her paintings combine accurate observation and knowledge of marine species with an expressive fluidity and treatment of the paint surface. The strength of these works lies in the subtle observation which underlies her skill at pattern making and layering of the paint surface. She now divides her time between the South of France and Devon and the work contains echoes, both of the clear waters and strong light of the Mediterranean and the more turbulent, tidal coast of South West Britain. She studied painting and drawing in Florence under Simi. In 1985 she moved with her family to the south west of France where she lived for 18 years. The light and colour of the landscape was a constant inspiration. Following visits to the Atlantic coast she made fluent lively studies of shellfish and sand in the pull of the tide, and also of the movement of shoals of fish. In 2003 she moved to Catalonia to concentrate on her observations of the sea. 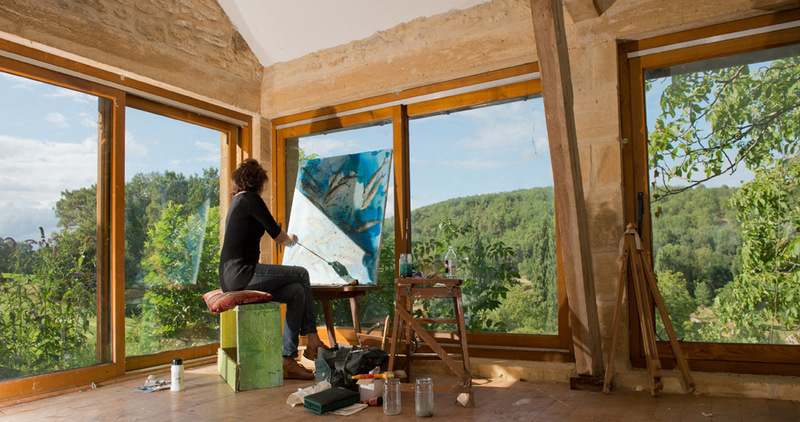 In 2005 she moved with her family to the southwest of England where she continues her work. Her paintings are widely admired and held in private collections in the UK, Europe, Australia and North America. You have a really good eye for details. I like the photographs very much! Also your paintings. Thank you for sharing! Love from Germany!